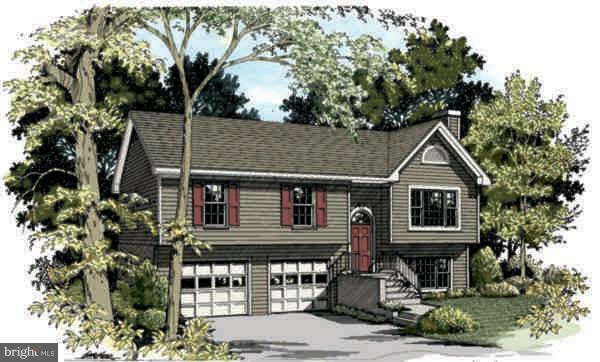 This awesome To Be Built split foyer home is situated on a spacious 6 acre wooded lot. Open design floor plan. The living and dining rooms are vaulted, open and large. The dining room is spacious and offers rear deck access. The breakfast nook offers additional dining space and is open to the dining room while the kitchen has an angled counter area making this the perfect location to entertain large gatherings of family and friends. Two bedrooms with ample closet space. Master suite offers a large bedroom, a walk-in closet and a bath which includes a garden tub and separate shower. Downstairs, you will find an oversized garage with a tucked away work space, a large utility room and a massive finished space which would be ideal for a family bonus room, teen suite or in-law suite. This home is well suited for the family who enjoys open living spaces and the option to expand in the future. Many additional custom upgrades available. 10k in closing cost assistance available when using builders preferred lender and title company. Builder Name Grove Contracting Inc. Listing courtesy of Remax Closers.